The Sixth Watch (2016. 391 pages) is the new urban fantasy novel from the Russian novelist, Sergei Lukyanenko, translated into English by Andrew Bromfield. The story is set in contemporary Russia. 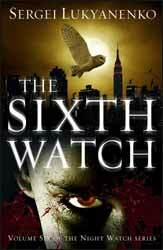 The Night Watch series of books have been spectacularly successful with the first couple of books being made into two movies, Night Watch (2004), Day Watch (2006), both directed by Timur Bekmambetov and well worth checking out if you haven’t seen them. The whole series, in one form or another, has revolved around Anton, who by this sixth volume is a powerful Light Magician. In this world there are humans and Others, the Others consist of vampires, witches, werewolves and magicians of various forms, with the human population being unaware of the Others existence. They gain their power through the ‘Twilight’ which consists of a number of levels which exist beneath our reality. Further, the Others are separated into good and evil, although, as long time readers of the series will understand, this is a more grey and arbitrary idea than the watches would like to think. Each watch oversees the actions of the other to keep the balance of good and evil. Prior to this novel Lukyanenko has tended to structure his books as three stories with an over reaching arch. While he has kept the three section structure, it is almost redundant as The Sixth Watch is one continuous story told from Anton’s point of view. This one relies less heavily on the magic side of Anton’s world; previous books have used the relative newness of the world to continually expand the world building, but by this point Lukyanenko is confident to produce an almost procedural noir novel. The book promises to be the last of the Night Watch books and, given the ending, it succeeds in its aim. Although, if it sells, Lukyanenko has left enough wiggle room to return to this world. The book is tightly written and the mystery sufficiently pulls you along so that the story never seems to drag. In truth, there is little in the way of character development, but this is because by book six this has been sufficiently covered. It’s sad to see Anton and crew bow out, but at least they have done so in style.